The first wave of invites for the WoD Alpha was recently sent out, and we got a firsthand look at the new pets in the Pet Journal! Many of the previously datamined pets found their way into the Pet Journal along with a new one, however the journal previews have not been fully implemented yet. Details on how these pets can be obtained is available but keep in mind that this information is subject to change. Here are a few notable updates from the Pet Journal. Some of these pets appear to be named and may not actually be obtainable by players, however one particular pet could be coming soon to a mailbox near you. Hogs, a humanoid battle pet, is currently listed as part of the achievement for WoW's 10th Anniversary. This pet appears to be Hogger's smaller counterpart (pictured right, courtesy of Wowhead). 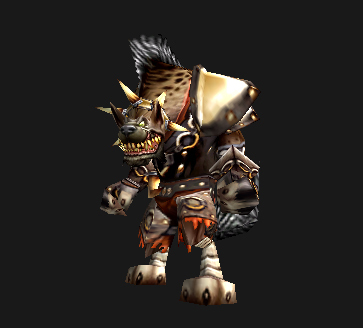 Will we actually be able to subdue this infamous gnoll and add him to our collections? Better set aside some fresh meat and bones for him to gnaw on just in case! Now that alpha invites have begun, be wary of any emails claiming to reward alpha keys or codes. There are no such keys. Currently access to WoD Alpha is made possible by invite only. The safest way to check if an invite was sent to you is to check your Battle.net account for an alpha client download. Keep your account and collections secure! @Pipehitter24: Should be Onyxian Whelpling and Baby Blizzard Bear. Darn, I guess I can stop complaining about no retired pets now that I can't get. Its just a shame they didn't make one for every anniversary. Drove me nuts that I can't get 5 or 6 pets because i didn't start playing till 2010. But a new person could get every pet I had today 4 years later. So I'm pretty excited to get this Hogger pet. Still envy the 2 I missed out on, 4th and 5th anniversary? Onyxia and poley? ?